Welcome to Sunshine Coast Weddings! Are you looking to plan that very special Wedding? 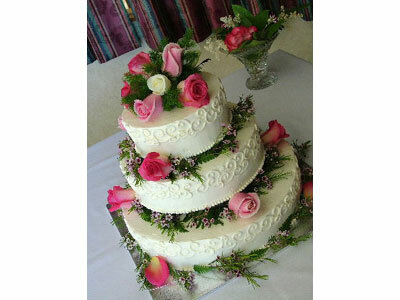 You will find information about local Wedding Planners , wedding venues, flowers, cakes and more! If you have a wedding tip or suggestion that would help others in their planning, we would love to hear from you. Please Contact Us! The Sunshine Coast can be a magical spot for a wedding, indoors or out and the variety of wedding venues can accommodate the most intimate to the largest of wedding size. For local wedding dÃ©cor, you can contact Tattle-Tales Party DÃ©cor. They are located in Gibsons. Call Tattle Tales at 604-886-9776. They can assist you in planning that spectacular wedding by providing wedding supplies, rental wedding arches, pillars, topiaries, tulle, White Lites and Candelabras!! Click here for Great Tips on Wedding Decorations - A great Article! 2008 Wedding dress styles are style venturing the side of glam and high fashion. We have put together an article for you on wedding dress styles for 2008 including beach wedding dresses! The article is a great read for those brides who want to be in high style at their wedding. For Wedding Day party rentals including tents you have a couple of local choices. There is Gibsons Party Rentals, Rent â€“ It â€“ Canada, and Fandango Sound and Tent Rentals. There are many special spots to hold your wedding. Some of the most creative are not booked venues, but public outdoor spaces. There are lots of forest and beach weddings on the Sunshine Coast! Check out the Sunshine Coast Beaches! Bonniebrook Beach, Davis Bay, Secret Cove, Trout Lake, Upper Roberts Creek, and Egmont all offer spectacular outdoor areas for weddings, weather permitting, or make sure you have lots of tents! The best way to find the perfect site for yourself, is to visit the areas you are considering. While their visualize your event. Everyone has a different 'Perfect Wedding' picture. The Blue Heron Inn, Bonniebrook Lodge, and West Coast Wilderness Lodge all specialize in wedding hosting and may be able to be of some assistance to you if your party is not too large in size. Rockwater Resort also specializes in weddings, and they have a spectacular setting and accommodations for your wedding party as well. Two community halls are available for bookings, Davis Bay â€“ Wilson Creek Community Association rents a hall located at 5123 Davis Bay Rd in Sechelt Tel 604-885-2818 and the Roberts Creek Community Hall is available as well at 1309 Roberts Creek Road, Roberts Creek, Tel 604-885-2715. Read all about weddings hosted at the West Coast Wilderness Lodge by visiting our special section, Sunshine Coast Weddings at West Coast Wildnerness Lodge. Paul & Patti were kind enough to answer some questions for us about what makes a wedding at WCWL special. To prepare for that special day, the beautiful bride needs some special pampering! Rising Sun Day Spa & Wellness centre specialize in weddings as does many other Spas and Beauty Salons. Check our local directory for the community you live in to see salons and spas available in your area. What would a wedding be without the memories provided by having an awesome photographer at your service. Clearly Now Photography in Sechelt specializes in weddings and they can make sure your special day is captured on film forever. Call them at 604-885-1406. Lucid Imaging Photography does photo-journalistic wedding packages and you can reach them at 604-740-0266. Beautiful flowers seem to go hand in hand with weddings, you have some great choices when it comes to wedding floral designers on the Sunshine Coast. Petals Flower Farm can provide fresh cut, locally grown, or florist flowers for your day. Garden Gate Florist in Sechelt Tel 604-885-6053 has a knack for creating that perfect look to compliment you dÃ©cor. You wonâ€™t be disappointed in either of these designers. Yummy wedding cakes can be custom made especially for you from the fabulous Sweet Chef, April Qureshi. The Sweet Chef is located in lower Gibsons, and can be reached at 604-989-CAKE. April's cakes can speak for themselves so we have included a picture here for you! Check out all of The Sweet Chef's creations at "The Sweet Chef"
Claytons Heritage Market Tel 604-885-9823 in Sechelt, as well as the Wild Bistro Tel 604-886-1917 in Gibsons, also do custom wedding cakes.